(2010) "No One Believes Me"
"Erase Me" is a song by American recording artist Kid Cudi, released August 17, 2010, as the lead single from his second studio album Man on the Moon II: The Legend of Mr. Rager (2010). The song features a guest appearance from his mentor Kanye West, and was produced by Jim Jonsin. The song debuted on a Cleveland radio station June 30, 2010, and was officially released to Rhythm/Crossover radio on August 17, 2010. On August 24, 2010, "Erase Me" was officially released digitally via iTunes. In 2011, the song was featured on ESPN's hit morning sports show SportsCenter. Jason Goldwatch directed the music video. Kid Cudi plays a Jimi Hendrix influenced character, sporting a black curly afro wig and headband. An excerpt from a longer format version of the video will be available through iTunes around the album's release date. Christopher Mintz-Plasse and Clark Duke make up the rest of Kid Cudi's band in the video. "Erase Me" made a Hot Shot debut on the Billboard Hot 100 at #22. On the 30th of August the single debuted on the New Zealand Single Charts at number 22. On September 5, the single debuted on the UK Singles chart at #58 and #18 on the UK R&B Chart. 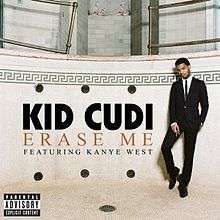 ↑ "Single: Erase Me - Kid Cudi Feat. Kanye West". http://datnewcudi.com/2010/08/23/single-erase-me-kid-cudi-feat-kanye-west/. Retrieved 24 August 2010. ↑ "Australian-charts.com – Kid Cudi feat. Kanye West – Erase Me". ARIA Top 50 Singles. ↑ "Austriancharts.at – Kid Cudi feat. Kanye West – Erase Me" (in German). Ö3 Austria Top 40. ↑ "Ultratop.be – Kid Cudi feat. Kanye West – Erase Me" (in French). Ultratip. ↑ "Charts.org.nz – Kid Cudi feat. Kanye West – Erase Me". Top 40 Singles. ↑ "Swedishcharts.com – Kid Cudi feat. Kanye West – Erase Me". Singles Top 100.